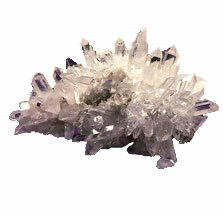 The Sphatik is a snow rock crystal and comes in purest and most favorable gem in the world. Sphatik is a clear transparent, glistening and smooth stone. According to Indian astrology, Sphatik is associated to the Planet Venus (Planet of love). Mostly Sphatik is used as a replacement for diamond to quiet down the effect of planet Venus. The idol which is prepared by Sphatik does not necessitate "pran pratishtha" before worshipping. Holy Sphatik Shri Yantra is used for universal winner and success in life. Sphatik Mala is widely used for meditation purposes. Regular worshiper of Sphatik statues gets good luck, cheerfulness and prosperity. Sphatik is the purest material obtainable on earth to make god idols for worship.